When Jesus told the famous parable about The Prodigal Son, it is a bit convicting because I see how easily I can become like the older brother. I become like the older brother when I compare myself with others. About a month ago I set up lunch with our worship pastor. He suggested we meet at Chipotle Restaurant and then says, “Hey I’ve got great news! 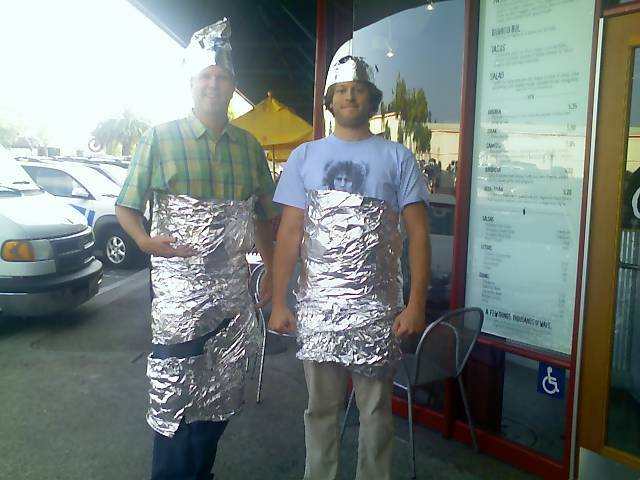 On Halloween if you dress up like a Chipotle burrito you get a free burrito!" Which meant wrapping ourselves in foil. So there we were, in the parking lot, wrapping ourselves head to foot in Reynold's Wrap. From below my knees to under my armpits I was covered with aluminum; not to mention the attractive, reflective head covering. We shuffled across the parking lot getting all kinds of looks. My colleague says, "Great news! No one else in there is dressed up!" I’m thinking this is not great news! This was a promotion from last year and we’ve wasted our time. As we get in line I am wondering, "Will this work? Does this qualify? Is this good enough? Have I done enough to earn a free burrito?" Sure enough, we got the free burritos. But this is where it got interesting. As we were filling up our sodas, a guy comes in with a three inch band of foil wrapped around his wrist. Hardly bigger than a wristwatch. And I’m thinking, there is no way he is getting a free burrito. Five minutes later here he walks out. I have to ask him, “You paid for that burrito, right?” He looks at me and says, "Dude, no. Got it free. Dressed up like a burrito!" as he shows off his shiny bracelet. And I’m thinking. "This is not fair! This is wrong! Look at all that I’ve done. And he gets by with just that?! That should not qualify. Unfair!" But why am I complaining? I got a free burrito too. There’s a little bit of older brother in all of us and it reveals itself all the time. I also get more like the older brother when I compare myself with others. Over the years I have realized that God's plan for each individual is personalized. It doesn't help to compare ourselves with the work of God in someone else's life. Instead, as in Jesus' parable, accept the grace God has for you. Consider His work in your life. Follow His plan for you. Cherish His personalized goodness to you.